* descriptions of more than 100 drills for teaching and refining the execution of specific techniques and tactics. But coaches will learn more than offensive and defensive strategies--they'll also discover the importance of developing a coaching philosophy. Through more than 40 personal anecdotes, Wootten explains how success should be measured in terms of effort and execution rather than outcome. He also explains the vital role of communication and motivation in building a basketball program. Coaching Basketball Successfully is more than Xs and Os. It's the definitive basketball coaching manual from one of America's foremost high school basketball coaches. Morgan Wootten has been the head basketball coach at DeMatha Catholic High School in Hyattsville, MD, since 1956. His 88% win record is one of the highest in high school basketball history. Another great achievement is the fact that since 1960 every graduating player has been offered an athletic or academic scholarship. Many of his former players have gone on to play in the National Basketball Association. Wootten is also a developer of future coaches--seven of his former assistants have gone on to become Division I head coaches. In 1991, Wootten received the Naismith Memorial Basketball Hall of Fame's most prestigious single honor, the John W. Bunn Award, for his contributions to basketball and sport in general. He was selected as the top 1990 teacher-coach of all sports in America by the Disney Television Channel. During his coaching career, Wootten has been named National Coach of the Year 5 times and Washington, DC, Area Coach of the Year more than 20 times. He is a charter member of The Washington Metro Basketball Hall of Fame. Wootten has also served as chairman of the Selection Committee for the McDonald's High School All-American Basketball Team. During the off-season, Wootten runs his own camp and speaks at basketball clinics and seminars worldwide. He has also written five books and produced three instructional tapes. He and his wife, Kathy, reside in Hyattsville, MD. In his spare time, he enjoys reading, golfing, and traveling. "Coaching Basketball Successfully is as fine a teaching aid on the development of a high school basketball team and program as I have ever read; and I have studied almost every book that has been written about this sport. I can also state, without fear of valid contradiction, that it can be invaluable to a coach on any level." "Morgan is such a great teacher! In Coaching Basketball Successfully he is able to share his ideas on coaching in a clear, precise manner. He has always amazed me with his ability to organize and teach. This book will help coaches, players, and fans gain a greater appreciation of our game." 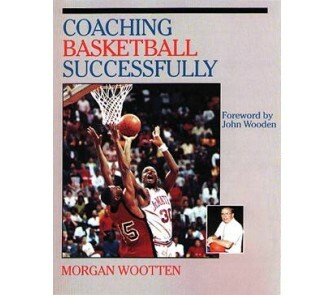 "All of us in coaching should be grateful that Morgan Wootten has made his tremendous experience available to us in this book."